The stem is hollow rather than solid. This makes the Yuuki cup easier to use and makes it much more comfortable to wear. There is no discomfort or pressure on the bladder. The medical grade silicone is ultra-soft and will never cause any kind of discomfort at all. The small version of the Yuuki cup is perfect for teens. It’s much easier to use and seals around the cervix to prevent any leakage. Even women with a high cervix are able to use the cup without any pain or leakage. The larger rim does a great job of keeping the fluid where it’s supposed to be. Getting the wrong size can lead to poor seals with the cervix. This will lead to leakage and discomfort. Since the company sells two different sizes of the cup, it’s important to get the right one. This will also mean that getting the right softness is just as important. It may take a few tries to get the perfect fit for your body. 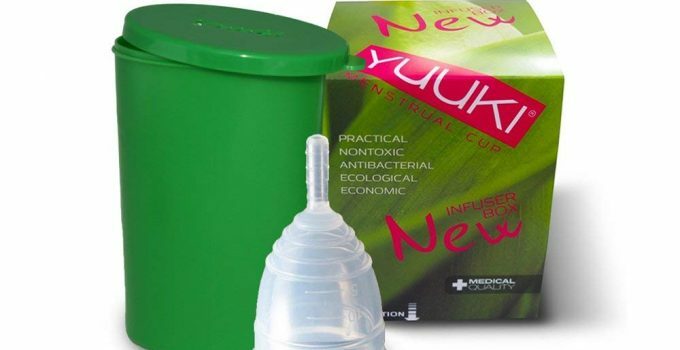 The Yuuki menstrual cup is a great choice when it comes to similar products. It comes in two different softness options to suit your body. It edges out the competition in terms of comfort and ease of use. The hollowed out stem is a very nice addition to the overall design. It makes removing the cup as easy as it could possibly be. It also adds to the comfort once it’s inside. The quality is high and the company cares greatly about keeping the manufacturing safe for the end user. With policies that rival medical and food grade silicone products, this cup really comes in as a leader of the pack. If you’re searching for a cup that will last you a very long time and keep you safe, this is going to be one of your best bets. You won’t go wrong with it once you’ve gotten used to insertion and removing. It’s great for women who have been using menstrual cups for years, and women who have only just begun their periods alike. It’s a great option and certainly worth a try. The cost will pay for itself in just a few months. This Yuuki menstrual cup review will focus on the details of the product and the impressive way in which it’s manufactured. Health and safety are of the highest concern for this company and it shows in their products. This cup will last for ten years with normal usage and will pay for itself within a few months in tampon and pad savings. The Yuuki cup comes in two different sizes and hardness options. It’s constructed with medical grade silicone and will fit comfortably no matter what you’re doing. It can be worn during physical activities as well as times of rest and relaxation. It should be purchased with the Yuuki infuser box to clean, disinfect and store it in between periods. The box can also be used to simply carry it around. The Yuuki reusable menstrual cup has a life span of ten years. The money that you spend on the cup will be made back within 4-7 months of regular usage. It’s produced with high grade and reliable materials. The high capacity of 42 ml is ideal for long-term usage and heavy flow days. For added convenience, the infuser box functions as both a sterilizing cup and a carry cup. Three different options at three different pricing points exist for the Yuuki cup. In the case of options without directions, they can be downloaded directly from the Yuuki web site. Economic: The least expensive option, this is a single cup and nothing else. It does not come with the infuser cup or the instructions. You can choose from the two standard sizes offered by the company. Classic: This is the most popular Yuuki menstrual cup option. It’s the firmer style and comes with the infuser cup. It runs in both big and small sizes. Soft: The softer version of the classic option. 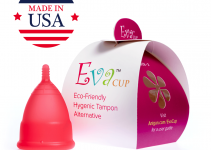 Once again, it comes with the infuser cup and your choice of a big or small menstrual cup. Cleaning is fast and easy. You can do it whether you’re at home or on the run. As long as you empty the cup regularly, there’s never any chance of toxic shock. Always wash your hands before and after removing the Yuuki reusable menstrual cup. Empty out the cup into the toilet. Wash the Yuuki cup with warm water and a mild soap. Empty out the cup into a toilet. Wipe the cup out with clean toilet paper. Storing is most easily done with the infuser box. It also doubles as a carrying case if you know that your period is about to start soon. Fill the Yuuki infuser box with warm water. Place the cup directly inside. Tighten the lid to ensure no water will boil over and cause burns. Place the filled infuser box in the microwave on high for 5-6 minutes. Remove the box and slowly open the lid after allowing it to cool. Empty the water, and the sterilized Yuuki cup can now be safely stored until you need it again. Zuzana Polackova created the Yuuki reusable menstrual cup in the Czech Republic. She had the idea after considering what better options there had to be for feminine hygiene. While working as a diving instructor in Mexico, she would often see the waste left behind by women on their period. It littered the beach and she realized that she has to try to do something about it. The cups are manufactured in a clean room. It has the same separate entrance, air conditioning, and anti-static flooring that you would find used in the production of medical equipment. This prevents any sort of contamination. The company makes sure to fully comply with international standards and practices. Customer feedback is overwhelmingly positive for the Yuuki menstrual cup. They say that the texture is far superior to that of any of the competition. According to real users, it’s much slicker and the rim is slightly larger. This makes it both more comfortable and less likely to leak while it’s being worn. Other women are quick to point out that the cup is very easy to clean. Many have said that the suction holes and hollow stem add to the ease. The vast majority would recommend it. They love how surprised they are at how well it actually works for them over all other products. Can I use the cup if I have long nails? Yes, you just have to be a little bit more cautious when inserting and removing it. Otherwise, you can go about your day like you normally would. How do I clean it if I’m not near any running water? If you can’t get to a water source, simply clean the cup out with a cloth or paper towel. It will be clean enough to continue using until you can get home to properly wash it. Can I wear the cup while I’m swimming? Yes, the Yuuki menstrual cup is totally safe to wear while you’re swimming or bathing. It will continue to protect you from leaks and you won’t feel a thing. Is the cup sent discreetly? Yes, the cup comes in discreet packaging. No one will know what you’re receiving on the day that you get it. The Yuuki cup is best stored in the infusion cup. If you don’t have one, you can simply store it in a cloth bag after you sterilize it at the end of your period. Can I share my Yuuki cup with a friend? No, you cannot share your cup. It’s understandable that women in some parts of the world will have trouble paying for their own cup, but using someone else’s is always a bad idea. Not only can it lead to the transmission of diseases, but can also cause many different kinds of infections.